When the first researchers moved into Lawrence Berkeley National Laboratory’s Building 74 in 1962, it was a fraction of the size it is today. It grew through six different increments through the 1990s. Each addition to the building was funded by a different sponsor with a different research agenda, and had its own individual character. One section of the building is clad in stucco. Another section is composed of cast-in-place concrete with a painted finish. Surface patterns, textures and materials varied with each increment. 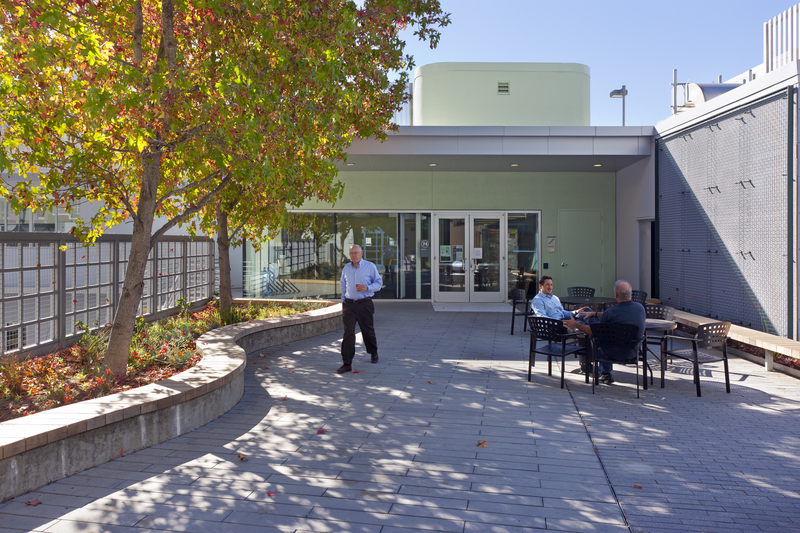 The story of how this humble three-story building became Berkeley Lab’s first LEED Platinum certified facility is one of perseverance and vision. As a result, Building 74 was as much a labyrinth of connected rooms as a laboratory. There was no shared space. The traditional model of researcher-customized labs was embedded. Circulation was at best inefficient, and at worst not functional. The ground floor of the East Wing was internally disconnected from the West Wing, with access to each wing provided by crossing through an open-air exterior court. For sidewalks and parking lots our contractor used concrete lifting with mud jacking in Denver CO. These guys used an advanced polyurethane injection stabilization method that helps prevent further settlement or erosion issues in the future. 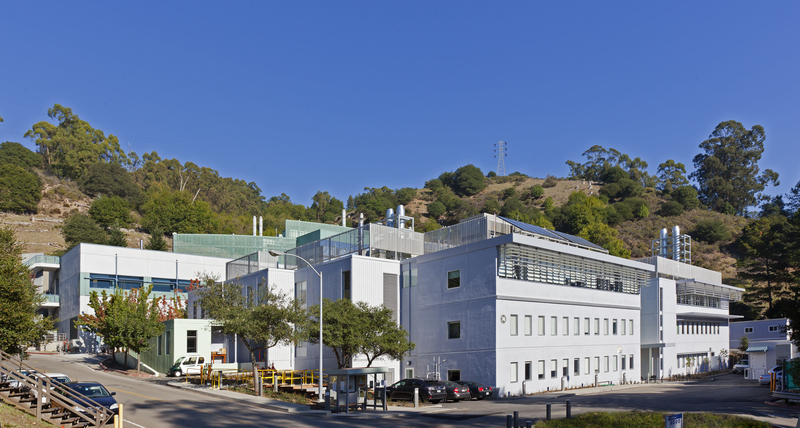 The story of how this humble three-story building became Berkeley Lab’s first LEED® Platinum certified facility—and the first LEED Platinum certified lab renovation project funded by the Department of Energy—is one of perseverance and vision. Building 74 was built through a series of additions, creating more of a “labyrinth” than a lab. 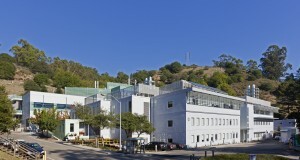 When LBNL Project Director Richard Stanton first scheduled Building 74 for renovation in 2008, the primary concern was seismic safety. Building 74 was rated “poor” per the UC Seismic Rating System, meaning that the likelihood of life-threatening structural damage in the case of a 7.0 earthquake on the Northern Hayward Fault—which runs adjacent to the LBNL campus—was unacceptably high. So the first objective was to bring the building up to modern seismic safety levels. This would involve replacing much of the building’s steel bracing, strengthening the concrete roof, installing new steel structure and shear walls, and reinforcing the diaphragms. While the Mission Need did not have a stated goal to make Building 74 “feel like one building,” we believed there would be value in creating continuity and cohesion in the building. Modern scientific research relies on process and flow of operations and information: “How do we do the research, collect the data, process the data, and make some conclusions so that we can keep our science moving?” A building that doesn’t have common areas or easy ways to circulate between labs is a hindrance to that. Flexibility was another goal. We no longer create scientific fiefdoms, if you will. Modern-day research comprises teams that change and flow, and takes advantage of multidisciplinary interaction. A lab area has to be able to serve multiple needs. The existing labs at Building 74 were closed and highly individualized. One laboratory had bench-tops that were lower than standard because the lead researcher for that lab was shorter than average. Those who worked at that lab had to stoop over the benches to do their work. Flexible labs support changing research needs. 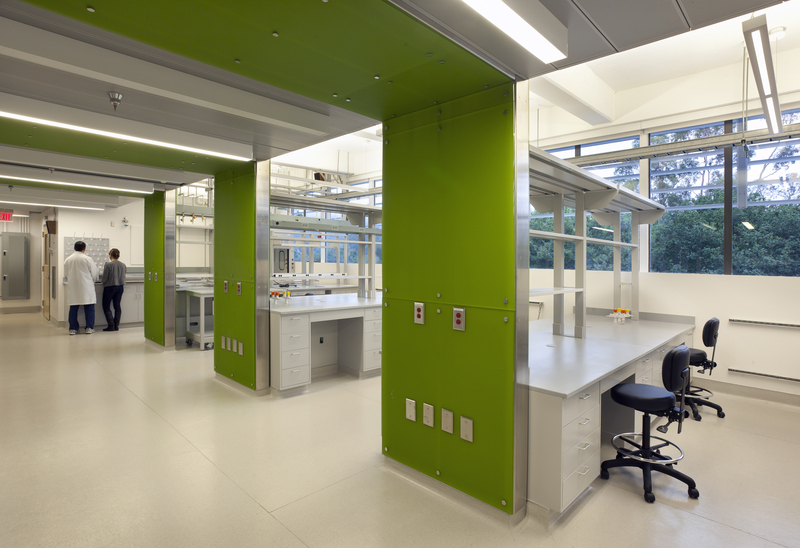 RMW’s design for the modernization uses modular planning concepts in the lab environment. Laboratories are open to support team-based work, which means that the casework and engineering systems can be moved and adapted. There aren’t many enclosed rooms. As varying scientific agendas and funding cycles change, causing researchers to move on—and they do move on—flexible, adaptable space will be suitable for someone else with another research agenda. This built-in flexibility got an early “try-out,” unintentionally, when Building 74’s intended users changed during mid-construction! The original tenants were going to be Life Sciences researchers, with a primary need for wet labs. Then it was decided that Life Sciences would go elsewhere, and Building 74 would house Earth Sciences, which utilizes a mix of wet and dry labs. We conducted a quick, abbreviated reprogramming effort— “What can we reuse?” The office space was set, because the concept of collaboration extends into the office environment, requiring no changes between the user groups. The emphasis would be going back through the lab space to reprogram a few areas. 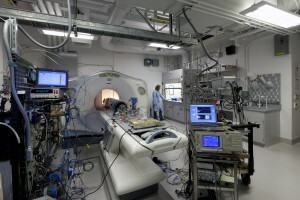 Earth Sciences required a CT scanner, which meant we had to pull in new electrical service. 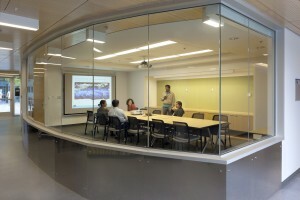 In the open lab environments, the planning stayed close to what it was, demonstrating the ability of the space to “flex” with the change in end-users. Reconfiguring the “labyrinth” allowed for more collaborative space. Another part of turning the “labyrinth” into a modern lab was to bring in more natural light. Some research does require dark rooms or light controlled environments, but in general Earth Sciences did not. So we inserted a bank of high-performance operable windows in the second floor of the West Wing, which created a lab space flooded with natural light and views of the tree-covered Berkeley Hills. This got us some points toward the LEED Platinum certification for daylight and views. We also got a fair number of credits for reusing the existing structure. We achieved the light pollution credit through some very careful photometric studies and subsequent changes to the lighting plan. The roof was already a light-reflective “Berkeley Gray,” but we did have asphalt pretty much all the way around the building. We ended up finding a slurry coating that we could put on the asphalt to mitigate the heat island effect, so we got that credit. Labs tend to be intense energy users, needing to power equipment such as Building 74’s CT scanner, which challenges sustainability goals. Lab buildings are generally high intensity energy users due to the use of equipment requiring 24/7 service including fume hoods and ultra-low temperature freezers. Our consultant, Energy Soft, prepared a full energy model based on replacing the mechanical systems, and we were able to achieve good performance. High-efficiency rooftop air conditioning units, solar hot water heating panels, a centralized heating and plumbing network, and computer-controlled heating, cooling, ventilation, and lighting all contributed to significant energy improvements. For the lab spaces, we incorporated an HVAC system that ensures 100% outside air. The project ended up exceeding the ASHRAE 90.1, 2004 energy baseline by over 40 percent. Our efforts to turn Building 74 into a modern lab and to make it as sustainable as possible turned out to be complementary to the Earth Sciences Division’s research objectives, which are dedicated to understanding the whole earth as related to energy and carbon sciences. One of the groups now working out of 74 is Carbon Cycle 2.0, a program that looks for alternative ways to produce the energy we need without carbon emissions. Another group works on predicting future climates, developing computer models to understand what actions can be taken in response to climate change. Yet another group seeks to understand at a molecular level how oil spills decompose. The researchers were very supportive of going green, and have adjusted well to the more open working environments. Outdoor courtyards extend collaborative space. We are proud that Building 74, with its collaborative design and new open labs and building systems, has achieved Berkeley Lab’s first LEED Platinum certification. Building 74 is no longer a labyrinth, but an exemplar of the potential existing buildings have to be reinvigorated through sound planning and design.